An unbiased review of the Ugee 2150, a Wacom Cintiq alternative. I bought the unit on my own from Amazon and tested it out for two weeks. Very easy setup. Download the right driver from the Ugee website. I had to fiddle with the Color to get it right on and off for 2 days and at the end it was not noticeably different from my laptop screen. Meaning I can paint on the tablet screen without final adjustments to match it to my laptop. The fact that it also comes with a convenient adjustable stand is nice. You can't push it too far down or else the cords underneath would be ruined over time, but I use it between a 45-90 degree angle so I was good with that. The new Wacom Pro model does not come with a stand that rises above 45 degrees- that is an add-on you have to buy. At a $2000+ price point the Wacom Pro product should already come with a nice stand. Maybe there was a slight parallax but I didn't notice it. I couldn't get used to this. At its lightest setting it needed to be more pressure sensitive. I felt I needed to apply slightly more pressure with my wrist to get thicker strokes. Over time (maybe a year+) I wonder if that would result in wrist strain. At times I had trouble going from thin to thick strokes. When I was zoomed in this wasn't a problem, but I like to work where I can see the image as a whole and for some reason the pressure sensitivity was only OK at that size. Because of the slight lag, sometimes it felt like brush strokes would be more straight than curved. There was also a slight lag during the start of a brushstroke. I think this also negatively affected the precision. But it is probably something I could get used to over time. I had no problem with the glass surface, that was fine and easy to clean. Easy color setup! I was able to adjust the color the UGEE settings and my laptop color profile settings. It took one or two passes but it came out 95% accurate. I'm a stickler for color so I was surprised. The screen was a little brighter than I expected, but that was adjustable as well. I couldn't individually adjust the RGB sliders on the UGEE but I didn't need to. The Ugee 2150 is supposed to have an ISP screen, but I felt like the colors minutely shifted at different angles. This didn't bother me though, painting was fine with it. Occasionally the driver would hiccup, causing the pen to freak out, but this only lasted a second. I noticed it 2-3 times in a 6 hr sitting. It didn't bother me. Wacom drivers couldn't be installed at the same time, which is normal for non-wacom tablets. I am really impressed by this Ugee model. You definitely get your money's worth. It's not a Cintiq knock-off, its a useable product and great for painting. The budget and great specs make it extremely competitive with the Cintiq. If someone has never tried a large display tablet before, it is totally worth it. 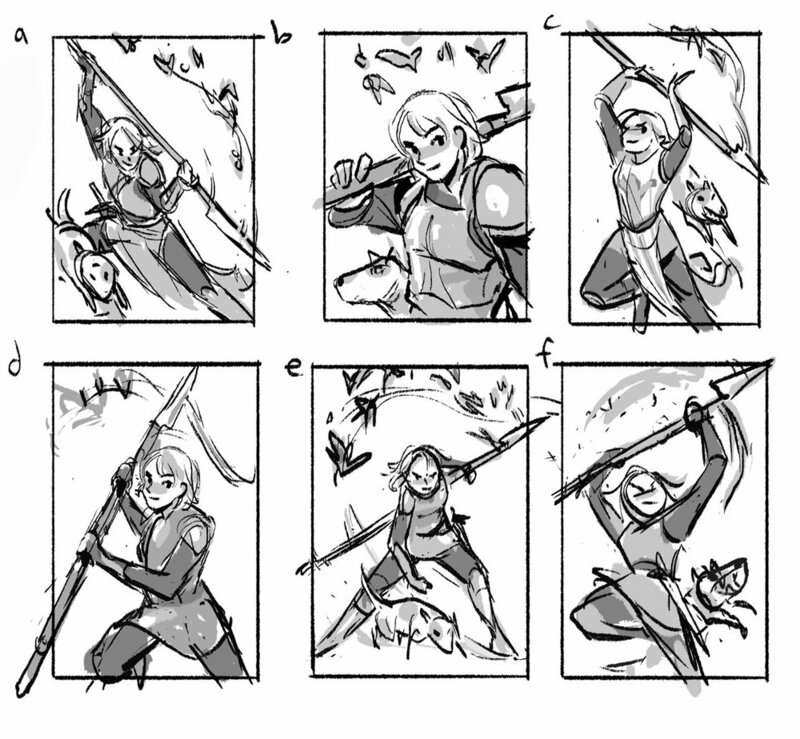 However, for line-based work I think it is not as responsive as I want it to be. I also wish the pressure-sensitivity was better! Sadly I will be returning it because I do need a more pressure sensitive display tablet. But I wish the Cintiq had a build similar to the UGEE! I love its design. I'm going to try the Huion Kamvas 191 next. Verdict: Returned, but very impressed! Great for students and people on a budget. Pressure sensitivity is good but could be better. FINALLY finished Daine up! 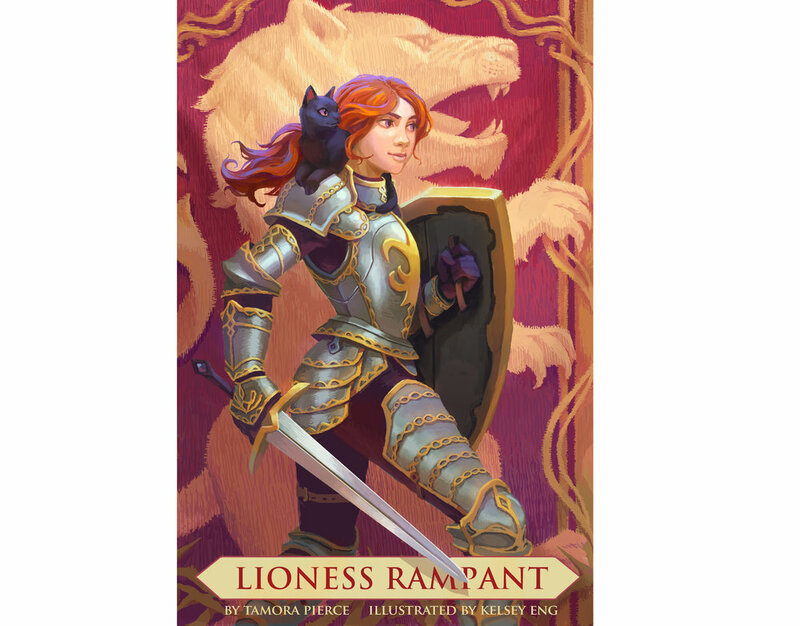 She is my favorite of the trio, the first Tamora Pierce book I read, and the reason I have a lifelong love for animals. Started this cover first before Alanna and Kel but finished it last because I wanted to get her just right. 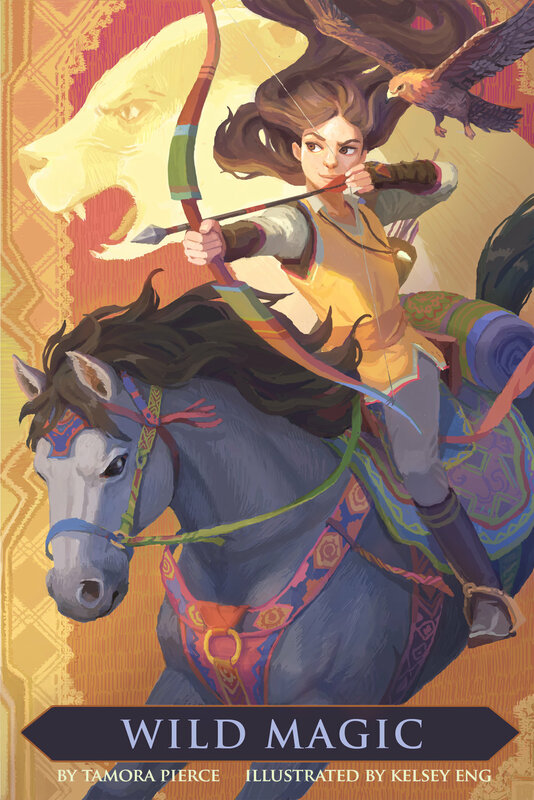 Daine is riding her pony Cloud, and has a bow in hand ready to shoot. Numair is flying by her side in a (more colorful) falcon form and the Badger god is in the background. I choose to focus on patterning and cloth to reflect Daine’s growing up in a small mountain village- and it also relates the threads of Wild Magic itself. SPX was amazing! This was my first convention out of state. We planned to do it with three friends but it ended up being just me and my friend Brandon Pogrob. As a benefit though, me and Brandon were able to spread out our stuff more on the table ^^. We were lucky and were placed near the entrance and next to Hamlet Machine, who attracted a large crowd throughout the event! I've looked around for perspective tutorials to recommend, but I haven't seen one that explained things the way I learned- they were either too simple or too complicated. Hope this works well for you! Fully CC'd in case audio is difficult to understand. Keladry of Mindelan from Tamora Pierce’s Tortall series. Finished this one up a month ago but have been slow to post. I think my favorite part of this one was painting the birds and the rough thumbs, she was fun to pose out. The patterns in the bg were influenced by Japanse patterns since Kel is from the Yamani Islands. Next one on my list is Daine, hopefully will get that done soon! 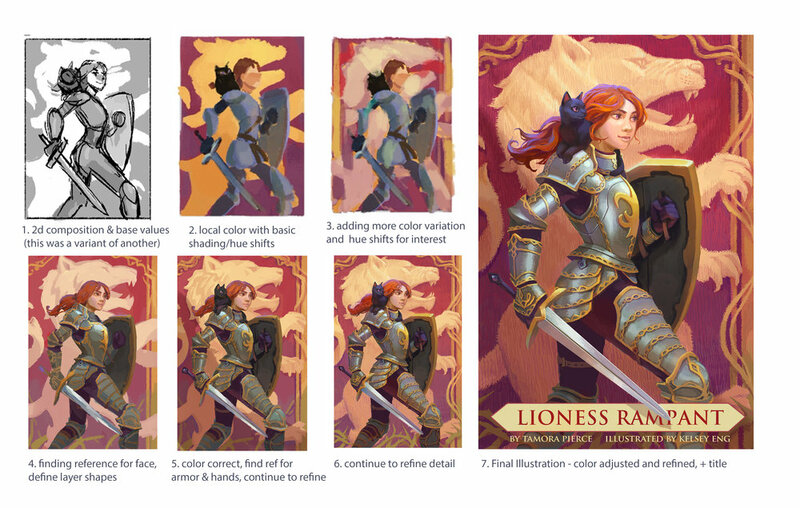 Final images with two color variations. The more realistic colored one (left) was my first pass, and then I used color adjustment on separate layers to create the blue/pink variant, which I think I actually like better than the red/green one! 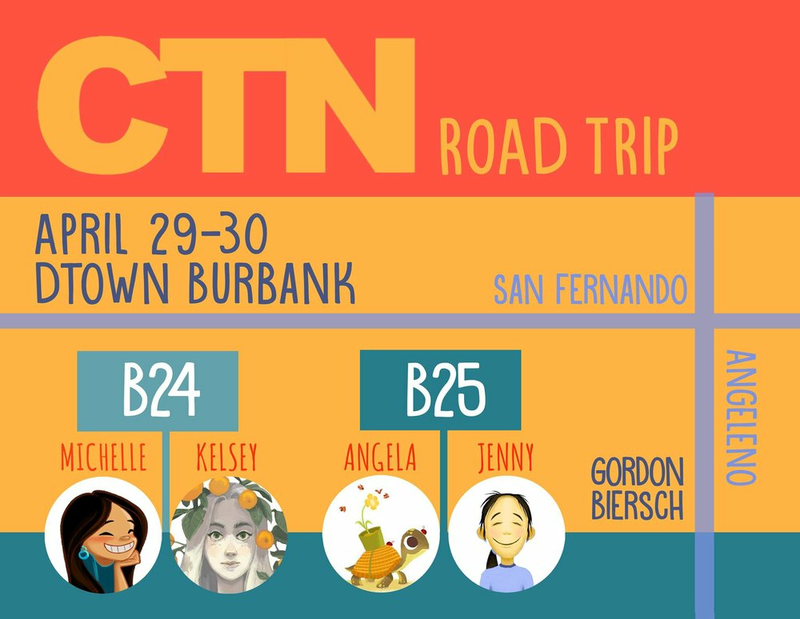 I had a great time at CTN Road trip. Would definitely do again. This was my first convention outside of the work conventions at Dreamworks and it was a lot of fun. I tabled with my friend Michelle Lin, and our booth was next to the Warrior Painters and our friends Angela Li & Jenny Cho. The foot traffic was great, I felt like I was constantly talking to a broad range of people- whether it was students interested in advice, people who were looking to hire artists, or just passerbys admiring art. I loved finally meeting people in person that I only knew online from instagram (shoutout to @heyouhai, @kuriotea, and @rachel_elese! ), and also meeting new people and making new art friends. The highlight of my day was when... I met my biggest fan- Constantine (@awesomegamer_boy). He bought one print, and kept coming back to ask me questions about Shiba Knight and the world they live in. He came back to buy the stickers, and later came back to buy more prints and even the book! He showed me a landscape painting he did too. It was great meeting his family and talking with him. It really inspired me to work harder and was much needed encouragement. Thanks everybody who stopped by and made the convention a blast :) ! Me and Angela's biggest fans! Thank you @awesomeboy_gamer and @awesomegirl_gamer! Got several freelance offers from the event, one from a legitimate company, and several others from people that probably wanted to underpay me for my services. Complicated online CTN portfolio website interface for the event, but luckily it was only an additional optional thing you could, not required to table. Avoid having a table near the life drawing- the drawing horses expand past their table parameters and it's hard to get customers over with the crowd in front of the table. Luckily we did not have that, but our table buds did. You will tire yourself out if you try to engage each person who visits your table in actual conversation. After a while I was able to tell if people were interested in buying something or just wanted to pick up a free business card.